I was lucky enough to receive the new CD from Disney to review. Well I say me, my daughters were the ones doing the reviewing really. Everything Disney is a big hit in the Hazelden household and this CD definitely impressed us. 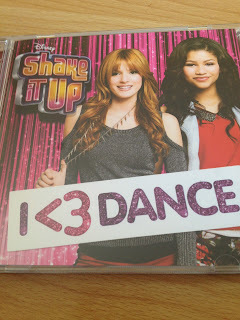 My 2 eldest children are big fans of the Disney hit show Shake It Up so they were very excited when I showed them what had arrived in the post. With 11 main tracks and another 6 bonus tracks, this CD will keep your kids dancing for hours. There are mixture of fast and slow songs and as you can see from the video below, the "tunes" as my kids said, were a big hit. With a mix of pop and dance, my daughters aged from 3 years old to 7 years old all found their own ways to move around to the music. When I asked them what their favourite song on the CD was, they all agreed on "Beat Of My Drum" by Zendaya. I have to admit, I even found myself dancing too, although my children weren't as impressed with my dance moves as I was with theirs!! Embarassing mum springs to mind.